USC researchers show stem cells fashion kidney functions based on when they converge together. Arriving early or late can have big consequences for early-stage cells that gather to form a new kidney, a team of USC researchers discovered. The scientists showed how progenitor cells that form the kidney’s filtering units, called nephrons, mature into entirely different types of cells based on when they reach the scene of nephron formation. The results appear today in Developmental Cell. The discovery advances understanding of how to assemble building blocks to fashion kidney tissue. Intimate knowledge of kidney cells helps advance drug development and treatment, fabricate kidney components and, ultimately, build new organs. About one in seven adults in the United States – or 30 million people – suffer a chronic kidney disease, according to the U.S. Centers for Disease Control (CDC). McMahon led a team of researchers building a blueprint of how the parts fit together and work. They discovered timing is critical as the precise arrival of progenitor cells dictates their form and function in the kidney. Specifically, it takes about 1 million nephrons to form a human kidney. The scientists observed that every time one of these structures forms, the nephron progenitor cells (NPCs) gradually commit to becoming various mature cell types and joining the developing nephron. NPCs that arrive early within the nephron start to differentiate and become the “tubule,” which controls the reabsorption of important compounds back into the blood and carries urine away. NPCs that occur late develop into the “glomerulus,” the structure that filters the blood. “Timing is critical in determining the type of mature cell that each progenitor will become,” said Nils O. Lindstrom, a principal author of the study and a researcher at the stem cell research center, which is part of the Keck School of Medicine of USC. To show that their predictions were accurate, Lindstrom and colleagues used genetically labelled NPCs in mouse kidneys and grew these under a microscope while capturing images with time-lapse imaging. This allowed them to demonstrate how NPCs gradually move into the newly forming nephron and turn on genes that are specific to particular cell types. Working with scientists in the Molecular and Computational Biology unit at the USC Dornsife College of Letters, Arts and Sciences, the scientists developed new techniques to analyze and interpret what is known as “single cell RNA sequencing data.” Single cell RNA sequencing is a novel technique that allows scientists to break apart whole tissues and organs and observe gene activity in every cell. Using this approach, the team documented how NPCs turn into intermediate cell types with specific gene activity, which identifies them as the precursors to particular mature cell types. 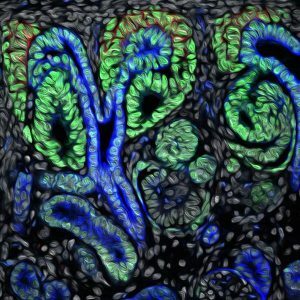 To achieve the full diversity of cell types in the nephron, when attempting to grow kidneys in laboratory settings, scientists need to understand how these precursor cell types form under normal circumstances in the body. Single cell RNA sequencing provides a view of all the genes and genetic pathways that are activated when specific cell types form in the nephron. Kidney failure is a leading cause of death for people in the United States. About 662,000 people live on chronic dialysis or with a kidney transplant. Men are 64 percent more likely than women to suffer end-stage renal disease and the risk for African-Americans is four times higher compared to whites, according the CDC and the American Kidney Fund. Authors of the USC study include McMahon, Lindstrom, Guilherme De Sena Brandine and Tracy Tran. Additional co-authors include Andrew Ransick, Gio Suh, Jinjin Guo, Albert Dale Kim, Riana K. Parvez, Seth Walter Ruffins, Elisabeth A. Rutledge, Matthew E. Thornton, Brendan Grubbs, Jill A. McMahon and Andrew D. Smith. The work was supported by the National Institutes of Health (DK107350, DK094526, DK110792) and the California Institute for Regenerative Medicine (LA1-06536). USC Stem Cell is a collaborative, multidisciplinary effort working to translate the potential of stem cell research to the clinical imperative of regenerative medicine. Centered at the Eli and Edythe Broad Center for Regenerative Medicine and Stem Cell Research at USC, the initiative brings together nearly 100 research and clinical faculty members from the Keck School of Medicine of USC, Children’s Hospital of Los Angeles, the USC Viterbi School of Engineering, the USC Davis School of Gerontology, the Ostrow School of Dentistry of USC, the USC School of Pharmacy, and the USC Dornsife College of Letters, Arts and Sciences.